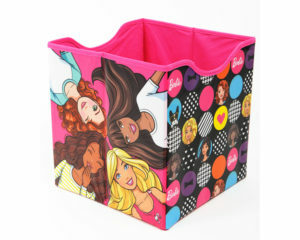 At 11” deep, the sturdy Barbie 40 Doll Storage Bin is one of Neat-Oh!’s largest storage items. It’s a straightforward, easy way to store up to 40 Barbie dolls – or fewer dolls and many accessories. It’s also perfectly sized to fit into most modular storage units. When empty, the cube can be collapsed flat for later use. 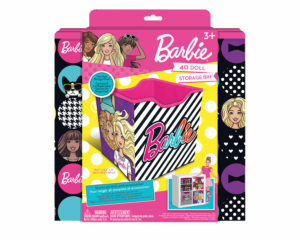 Each of the four sides features a different Barbie image! Like every Neat-Oh! 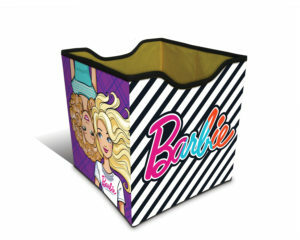 product, the Barbie 40 Doll Storage Bin is manufactured to the highest quality and safety standards. The company’s comprehensive product testing program exceeds industry requirements. It tests for 19 heavy metals, not the mandated 8, it hand sews products, and it uses self-repairing zippers and food-grade inks. They’re products you can believe in. Neat-Oh!® Products – Keep it Together™. BARBIE and associated trademarks and trade dress are owned by, and used under license from, Mattel, Inc. © 2017 Mattel, Inc. All Rights Reserved.